"This takes some time to make, and there is expert-level stirring involved, but what a small price when you consider the final results. 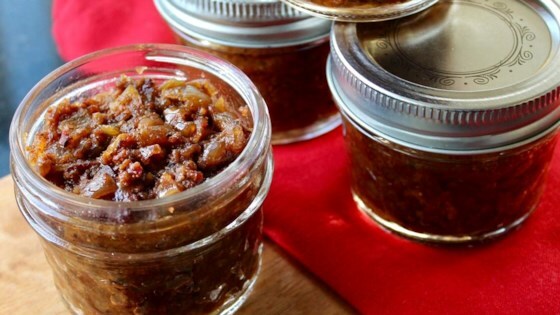 Whether you do this for your Super Bowl® party or another festive occasion, I hope you give this amazing bacon jam a try soon." Place bacon in a large, heavy-bottomed pot and cook over medium heat until bacon is crispy and the rendered fat is foaming, about 10 minutes. Pour bacon and rendered fat into a strainer placed over a bowl to drain fat. When fat is drained and bacon is cool enough to handle, remove bacon to a cutting board and finely chop. Return pot to medium heat; drizzle 2 teaspoons reserved bacon fat and butter in pan. Saute onions and 1 teaspoon salt until soft and translucent, 7 to 10 minutes. Stir brown sugar, sherry vinegar, 1 teaspoon thyme leaves, black pepper, and cayenne into onion mixture; add bacon. Stir water into bacon mixture and cook until jam is a brick-brown bacon color and has a jam consistency, 10 to 15 minutes. Remove from heat and stir balsamic vinegar, olive oil, and remaining 1/2 teaspoon thyme into jam; stir until shiny and heated through. Turn your favorite cured, smoked meat into amazing jam. this guy is a master. made it for promotion party. I remember how good it was don't remember who got promoted. I won first place at the bacon competition at the fair so that makes it a 5 star recipe in my book! This is going on my to-do list, but I just have to say how much I enjoy Chef John's videos! He is my favorite food entertainment! Keep it rockin' Chef John! This recipe looks YUMMY!!!! This is wonderful! Thanks Chef John. I wouldn't even consider changing anything about this recipe. I made just as the directions dictated and have been laid numerous times as a result at multiple parties! I love the sweet-savory thing going on here, and also that it coordinates well with the rest of the burger trimmings. It is delicious! Just made this for a Belmont party- what great flavor!! And a glass of champs is the perfect pairing.. The next day, I used the leftover bacon jam to make the best ever BLT sandwiches!